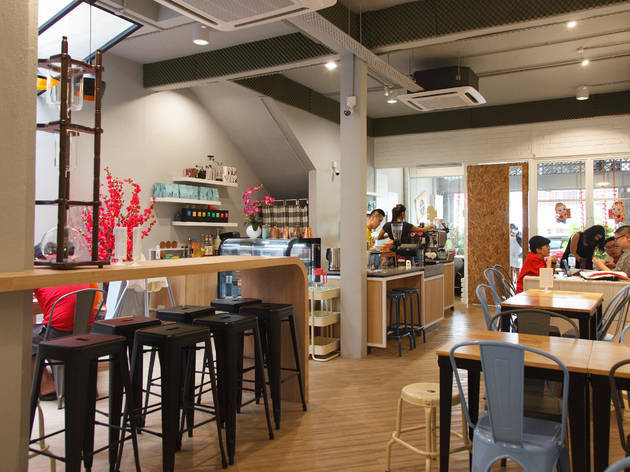 Filter coffee bar The Hub may seem like your usual neighbourhood café, patronised by families and yuppies hunched over their laptops. But the pink micro roaster at the shopfront hints at a slightly more serious pursuit – husband-and-wife team Nicholas Tay and Yuki roasts their own beans, and uses at least 41 bean varieties (from Thailand, Indonesia, Congo, Tanzania, Colombia, Yemen and more) for their filtered coffee; ten more varieties are sourced from Miami boutique coffee producer Ninety Plus and its offshoot Levelup Taste Profiles by Ninety Plus. Fun fact: Ninety Plus owns coffee estates in Panama and recruits some of the best baristas in the world to create rare blends, which have won awards globally. 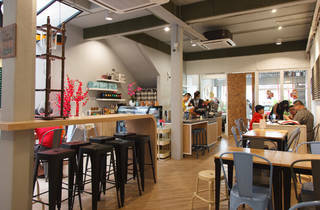 The Hub is simple: the decor boasts narrow interiors, wooden tables, framed eggshell boxes, with natural light pouring in through the skylight. If you ever drop by, we recommend the caramel-hued Ethiopia Lomi Tasha. Served in a small jug, delicate floral notes with a hint of black tea emanate from the light brew. You can pair it with their cakes or a light brunch, but we say go straight for the filtered and ice drip coffee.